It will be a fun-filled day that you cannot miss, including a range of rugby skills-based activities and games throughout. There will also be a climbing wall, bungee trampoline, and many more activities that are suitable for all ages! What’s more, there will be fantastic food and drink to enjoy, including bar facilities, a BBQ and plenty of cakes and sweets for those who require a little bit of sugar! Both players and mascots from Sale Sharks will be supporting us throughout the day, with an expected footfall and program circulation of over 1,500. Welcome to Priory Park, Macclesfield, home of the Cheshire Under 8`s Festival, and let`s hope the weather is kind and we see some free-flowing rugby from our budding stars today! Macclesfield are proud to have hosted the Cheshire U8’s Festival for a number of years now, and we are pleased to see many familiar clubs returning, so hopefully, we must have been doing something right!! I understand there are 40 teams represented today, with over 320 future rugby stars proudly representing their clubs from all corners of the North West and North Wales. Welcome one all! The emphasis of this tournament is about embracing the Core Values of our game – Teamwork, Respect, Enjoyment, Discipline and Sportsmanship – but let`s not forget why ANYONE plays rugby: For the sheer enjoyment of the sport. So please, by all means, get behind your team, but I know, in the spirit of rugby, you`ll all applause good play and sportsmanship from your opposition. 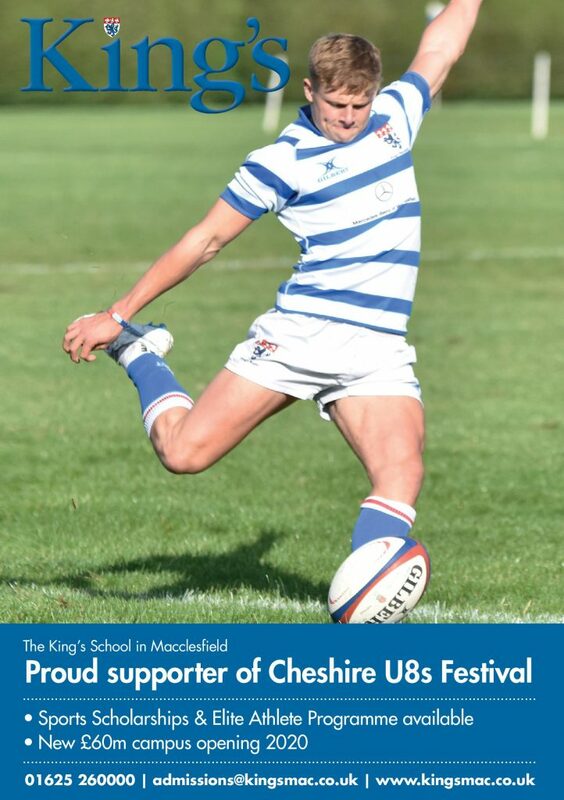 This year, we`re delighted to have as sponsors, The King’s School in Macclesfield, who will soon be our near neighbours. Thanks to everyone at King`s for your valued support, not only today but throughout the season. Welcome today to some of the Sale Sharks players and staff, together with some of our own Macclesfield 1 st XV players, some of whom started life as an Under 8 player and have progressed all the way, so who knows, we may be witnessing the start of some famous rugby careers this afternoon! Last, but by no means least, good luck to every one of the hundreds of kids taking part in today`s Festival – enjoy yourselves, have fun, make new friends and cherish the memories, win or lose, and you`ll all be winners. Thanks again to Kings School Macclesfield for sponsoring this unmissable event!